Inking white stickers is a great way to add create fun embellishments for your page and add dimension. In this layout I have used Doodlebug's gorgeous flower stickers to demonstrate this effect. Any pale coloured embellishments will work as long as they do not absorb too much ink. This layout was created using Doodlebug Bon Bon Sweet Stripes paper, Rhonna Farrer paper, three shades of brown cardstock, brown ink and Doodlebug Embrace Create Inspire Flowers stickers. Use the Doodlebug Bon Bon Sweet Stripes paper as the background, making sure the stripes are horizontal. Cut a piece of Rhonna Farrer paper measuring 20.5cm by 29cm. Adhere to the background approximately 1.5cm from the right edge. Cut a piece of light brown cardstock the same width as your photos and approximately 4.5cm tall. Add your journaling to this piece to make your journaling block. 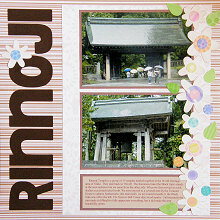 Mat two photos and your journaling block with your middle shade of brown cardstock. Lightly ink the edges of each with brown ink. Adhere them one above the other centred on your Rhonna Farrer paper, as shown in the layout above. Select the white flower stickers you are going to use. Ink the edges with brown ink. While the ink is still wet, smudge it across the flower. Because the sticker is not very absorbent, your flower will just be lightly stained and will not appear so flat. If you wish to make the flowers darker, simply add more ink. Of course, you can use any colour ink you like...brown just happened to suit my page best. Once you have coloured your flowers, arrange them down the right side of your page so that they overlap with your photos and journaling. Use the circle stickers to add the centres to your flowers. Use leftover circles and leaves to embellish around the flowers. Play around with your arrangement, and when you are happy with it, adhere them to your page. Finally, cut your title from dark brown cardstock. Adhere sideways along the left side of your page, as shown in the layout above. If you wish, you can decorate your letters with any leftover stickers.